This entry was posted in Going Green and tagged bee keeping, bees, colony colapse disorder, honey by cityhippyfarmgirl. Bookmark the permalink. Lovely post, Brydie! I am worried about bees too, so I’m always so happy to see them in our backyard. I’ve actually bought some organic honey and tucked it away – if (when) the varoa mite gets to our shores, it will be much harder for apiarists to produce organic honey. Have you tried the honey from Kangaroo Island? My friend Moo put me onto it – it has the last surviving colonies of Ligurian honey bees in the world. Some magnificent honey coming out of it. Great Post- you are so informative! I love bees- plant nectar producing flowers, season permitting. And I buy copious amounts of local honey. I’d like to have a hive- but I’d have to get a new husband, first. Thanks Heidi, I’m really glad you liked it. Thanks for the wonderful bee information. Great picture of the bee. I tried to photograph one at Lake Como – it was huge, but I only managed the legs. 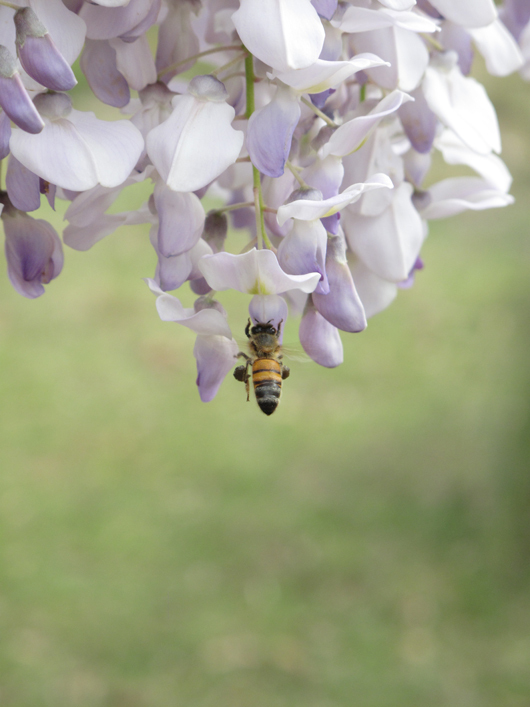 It was also collecting nectar from wisteria. The wisteria was gorgeous when I took the photo. Gently swaying in the breeze with so many buzzing bees loading up from it. I love bees! After we get chickens, bees will be next! Dixiebelle your back yard is going to be wonderful! Bees are so so important. and so undervalued. I had bees in my backyard until my neighbour became hysterical about me ‘killing everyone in the neighbourhood’. What does he think pollinates his vegetables? My hive went back down to my Dads place. We’re visiting the hive (and him :-)) over Christmas to harvest some honey. I can’t wait! I hope you get lots of lovely honey at Christmas time. Savour every drop. Loved the article Celia posted too. I would be chuffed to! Your own honey will be wonderful. Sonya that would be wonderful comparing the colours of the honey from season to season. Having a honey cellar instead of a wine cellar and being able to select which one you feel like using…bliss. The bee is an interesting little chap isn’t he? Thanks for the reminder of all the goodness in a spoonful of honey. I will definitely look out for pollen-laden bees around my place. Mmm, I wish I knew someone close by with a hive. We love our bees, all our visitors, wild, solitary, honey, white bottomed, yellow bottomed – we plant for them – lavender, cardoons, alliums – they drop in all through the year, sometimes quite early when the sun warms the air a little. I too have read about the exploitation of bees, it’s been a big subject here for a few years now. Did you ever see a Spanish film called Spirit of the Beehive? It’s very old now, it’s not really about bees, but it’s very good. Thank you for bringing the bees to my thoughts today! The bees you see out and about are female worker bees – the male drones are back in the brood box looking after the Queen. And you’re right, nothing taste like raw honey straight from the hive. lovely post. i have been trying to get my boys to have warm bread and honey before bed for ages…one of these days. I was so sad when I looked up a few months ago how much land you need to be living on to own hives. I wish I could stick a couple of hives on my roof, but it just ain’t that kind of house. Luckily, I think you’re allowed to keep native bees just about anywhere, as they don’t sting…they are lovely little pollinators for one’s garden, but are highly emotional I hear, so it’s difficult to transport a hive without stressing them. Great post. I get so passionate about bees – all bees and some of the appalling commercial practices that go on with honey bees. They are such amazing creatures and we are so dependent on them. This time last year we had a top bar hive made. We tried to attract a new queen, but had no luck. We now have some bees on order for the spring – so all quite exciting. CT used to keep bees in a previous life, but this will be the first time I’ll be involved. Lovely photo – I’m quite partial to bees, myself!! I used to not like bees, always trying to shoo them away, afraid they would sting me. Now that I have a garden and understand more about their value, I LOVE the wee critters and have filled my garden with flowers to bring them in! I would love to have my own hive/s but our space just doesn’t allow it at the moment. One day though, I dream of it!